Great colour! Came assembled which was great. My daughter loves it and uses it in her bedroom. It is a nice vibrant colour purple. It is soft and the fabric is nice. Functional and luxurious, this storage ottoman from The Curated Nomad is a perfect accent for any room. Deep purple upholstery lines the piece and is accented by classic silver nailheads and a button-tufted top. Store extra blankets inside the ottoman and use it for extra seating when you have guests over. This ottoman arrived exactly like it looked online. I was worried the color would be too "grape-y" since my room has more eggplant accessories, but it blended in fine. The quality is perfect and the storage is very roomy for extra pillows, throws, off-season items, even shoes and boots (but not all together)!. The size is excellent. I would not hesitate to purchase this item as long as the dimensions work for you. The grommets were perfectly placed, and all I had to do was screw on the four legs. Great look for the right room. I love this bench! It provides extra storage and is a fabulous accent at the end of my bed. This ottoman wit storage was just the finishing piece I needed for my boudoir! The purple color is perfect! Since me bed is high, I replace the 4" legs with 8"wood legs! The ottoman is sturdy and well built. I love it! Perfect for storing turtlenecks. I love the nailhead trim and the color is perfect in my master bedroom! This storage ottoman is beautiful! Even better in person. When it came, I was pleasantly surprised with the quality. My daughter has it in her room to store extra stuff. Nice Purple color and able to store some extra blankets (about 3 of them). Love the velvet - looks more rich. Will enhance with some pretty pink throw pillows on it. 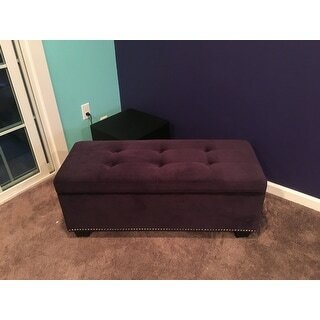 I have been looking for a deep purple velvet covered bench/footstool and am thrilled with this perfectly sized, studded downsized bench with storage. It is the perfect addition to my posh reading room. I love it! It also has a safety hinge to prevent unexpected closing. I got this for my bedroom and it's much nicer than I expected and I think it will last for years. The pewter nail trim adds a look of elegance to the ottoman. The tufted top is plush and comfy to sit on to put on your shoes or just to relax. I have it sitting at the foot of my bed. It has ample space to hide all of your Christmas presents and then all of your extra towels and blankets. You won't be disappointed! I bought this for my daughters bedroom but decided to put it in my main room to store blankets and pillows. 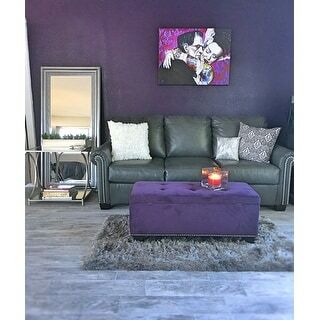 The royal purple is perfect for my living room. I love this. Bought this for my son to store his art supplies, gaming books and electronic keyboard accessories. He also uses it to rest his keyboard on when he sits on the floor to play it. He is 6'2" and has neuromuscular disease that prohibits standing for more than 15 minutes, so this bench is the perfect height for him to sit on the floor and play his keyboard. Except for the legs -which were quick and easy to put on without tools- the bench arrived fully assembled. The purple color is a nice, dark grape or eggplant, and my son loves it. Love this ottoman, beautiful color. Love the color ! Nice height for sitting and putting your shoes on, also catches my clothes just perfectly when I throw them in that direction. Great purchase !! The color matches my room very nicely. I sit on it to get dressed every morning. Nice size. I would recommend that the legs are made of a different material. I've been looking for an ottoman for living room. Love the color for my bedroom and need storage. I read the reviews and decided to take the chance because of the good ratings. "A reviewer indicated she replaced the legs with 8" legs vs. the 4" legs that come with it. Where did you find the replacement legs? Is that through Overstock?" This item is not available with 8" legs.